Medium: original woodcut. 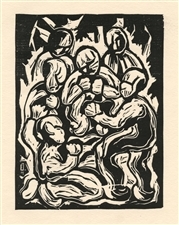 Printed in Germany in 1919 for Das Kestnerbuch, one of the most important collections of original prints published during the height of the German Expressionist movement. Printed on wove paper and signed in the plate (not by hand). The image measures 6 3/8 x 5 inches (170 x 128mm); the total sheet measures 11 x 8 1/2 inches (280 x 220mm) with full original margins. There is a repaired tear in the margin (well outside and not affecting the image). A rich, dark impression!